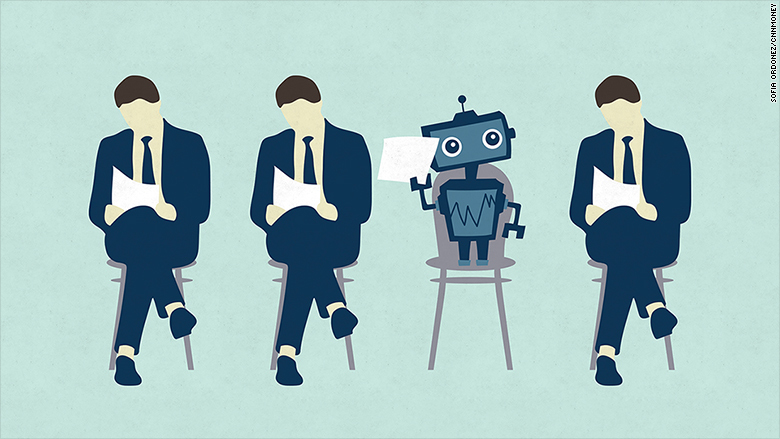 Soon you could be competing with a robot for a job. Economists are sharply divided over the exact timing of the threat from robots and other forms of futuristic technology. Some see an imminent threat, others believe it won't happen until later this century -- if at all. Yet Amy Webb, a digital media futurist and founder of Webbmedia Group, predicts at least eight career fields are "ripe for disruption" very soon -- like in the next 10 to 20 years. 1) Toll booth operators and cashiers: People who work in the transactional space shouldn't be big fans of the Apple Watch or Apple Pay. That's because the rise of wearable technology and mobile payment systems may make jobs like toll booth operator and grocery store cashier virtually obsolete. "There is no real need for a person to be there every step of the way," Webb said. 2) Marketers: Powerful advertising tools of the future may allow brands to fashion their messages to customers with precision accuracy. Webb pointed to new experiments with technologies that study customer behavior to identify what kind of ads will be most effective. "This is pretty much unlike anything we've seen before," she said. If these tools work, they may translate to smaller creative and strategic teams at marketing and ad firms. Related: Will this one-armed robot take your job? 3) Customer service: Many customer service jobs have been shipped overseas to India and other lower-paying countries. New technologies like predictive analytics could kill off more of these jobs. Look no further than Watson, the friendly IBM (IBM) supercomputer that won millions of fans by defeating former Jeopardy champions. Webb warns that one of the things Watson can do, though it's not positioned that way right now, is to replace everybody in the customer service department of a company. 4) Factory workers: Get ready for robots to steal more manufacturing jobs from humans -- at a cheaper price and without taking breaks to text their friends. The next wave of disruption is likely to be led by haptics, a sensor-based technology that allows people to virtually feel what they are working on even when the actual task is taking place far away. 5) Financial middle men: Don't knock Bitcoin -- Its underlying technology may steal your job. Blockchain, Bitcoin's computer program, is able to automatically process transactions and create a perfect, reliable digital record. Webb believes blockchain will disrupt the middle men in the banking, escrow, insurance and mortgage sectors. "Whether or not Bitcoin ever takes off is beside the point. It's the underlying infrastructure that will dramatically change the work that's being done," Webb said. We may have received a sneak preview of that this week when Nasdaq (NDAQ) said it will use blockchain to keep transaction records in its pre-IPO market. 6) Journalists: The Internet wiped out countless newspapers, and new technology could kill even more journalism positions. Webb, a former journalist at Newsweek and The Wall Street Journal, said the next culprit will be algorithms that allow news outlets to automatically create stories and place them on websites without human interaction. Robot journalists (fedora optional) are already writing thousands of articles a quarter at The Associated Press. 7) Lawyers: If you're going into the legal world, veer toward litigation. Webb believes non-litigation lawyers could soon be replaced by online form-based services like LegalZoom that can carry out simple tasks like trademark applications, wills and even divorce. It's all been made easier by the trend to make records more open and easily accessible, lessening the need for high-priced lawyers. 8) Phone workers: Many millennials don't have landline phones. That trend is only likely to continue with the advances of digital communication. That means telecom companies like AT&T (T) and Verizon (VZ) could eliminate billing, operator and other positions on the telephone side of the business. "There are a bunch of jobs that don't really need to exist," Webb said. Fearing the future? These predictions will make people who work in these fields understandably cringe. But Webb isn't pessimistic about what lies ahead. "I don't see our technological future as a dystopian one. I just see it as different. For many people different is dystopian, which is something you need to get over," she said. One outcome may be that tomorrow's employers will value very different skillsets than today's. "We need highly-skilled plumbers and highly-skilled people in all types of fields we no longer venerate," Webb said.